Can I Store Photographs in the Attic? How to Install an Attic Floor. If you're looking for more storage space in your house and have an unfinished attic, it's a good idea to install flooring and utilize that area for storage. Flooring an attic doesn't only give you more storage area, it also makes it safer to walk in the attic rather than stepping from joist to joist. 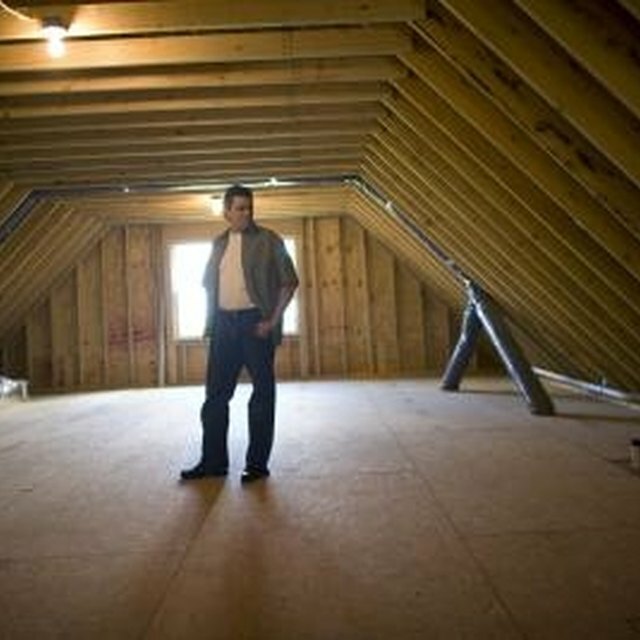 Set aside a weekend and install a floor in your attic. Measure the area of the attic you wish to floor. Then purchase enough 4-by-8 foot plywood sheets to cover the area you intend to floor. Cut each plywood sheet down to 2 feet by 8 feet to make it easier to get the sheets up the attic stairs and through the opening. Nail 1-by-4 inch furring strips along the tops of the joists with finishing nails so the flooring, once laid down, does not catch any wires that run across the attic. Or, you can cut notches 1-inch deep in the joists to lay the wires in and nail down metal strips over the notches to prevent screwing or nailing into any wiring when securing the floor. Use a chalk line to make a center line down the middle of the area where you are installing the attic floor. This line acts as a guide to keep the plywood sheets straight. Lay the long side of a plywood sheet against the center line so that one end falls in the middle of a joist. Nail or screw into place. Set another sheet beside that one, and secure in the same manner. Repeat the process in the previous step until the attic floor is complete. Start in the middle of the attic so that you have secured flooring to work on as you reach the ends of the attic, where there's less headroom. Floor only the area of the attic you intend to use for storage. Insulation between the joists works best when there's more air between the insulation. Also, keep in mind that installing an attic floor flattens the insulation, reducing the air space. Screws are preferable to nails when securing the flooring, in case you need to remove any sections to gain access to any electrical wires or junction boxes that can be covered by the floor. Start in the middle of the attic so that you have secured flooring to work on as you reach the ends of the attic, where there's less headroom. Floor only the area of the attic you intend to use for storage. Insulation between the joists works best when there's more air between the insulation. Also, keep in mind that installing an attic floor flattens the insulation, reducing the air space. Screws are preferable to nails when securing the flooring, in case you need to remove any sections to gain access to any electrical wires or junction boxes that can be covered by the floor. What Are Some Types of Lighthouses?